Ski lessons are the all-important first step to the sport of skiing. You might be able to figure some things out on your own, but it's so much easier (and less painful) to have someone more experienced show you how it's done. There are many ways to go about getting ski lessons. If you have never skied before, you can start by checking out the sites that allow you to learn to ski online. Naturally, nothing is better than experience, but reading and viewing online lessons can give you a great overview of what it's all about before you hit the slopes for the first time. Another idea is to talk to friends who know how to ski and ask them for some beginners tips that they can share. They will likely have lots of stories of their first attempts, but don't let them worry you. Like any other sport, skiing takes time to learn. Once you have taken some lessons and get the hang of how to do it, you'll find it well worth the effort you have put into it. Often the best way to get in some ski lessons is to hire an instructor. Snow ski instruction may seem pricey, but it is a worthy investment. You may enjoy your ski lessons so much; you'll decide to become a ski instructor yourself! Would you be surprised to learn that you can even get lessons for free? Yes, there are online ski lessons for free, but there are hands on lessons as well. Really! Lookout Pass offers it's Free Ski School to a limited number each year. 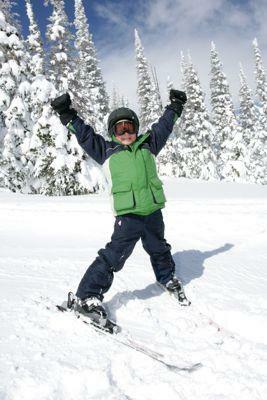 Many resorts offer ski lessons for free to novice skiers who stay with them as well. What a great excuse to plan a vacation. Plan a stay at a fantastic ski resort and get ski lessons while you're there! If you have a bit of experience, but still would like to learn more, many ski shops and sporting goods stores offer workshops to educate skiers, novice through advanced. Some hospitals offer adaptive skiing workshops for those with disabilities. Consider checking for a skiing club in your community. Often they will offer workshops and course for free or low cost. Becoming a member of the club will typically allow you to take the classes at a lower price. You'll make lots of new friends as well.